Court Backs Withholding 'Potent' Images Of Bin Laden's Body : The Two-Way The government has argued that the classified images could spark violence against Americans abroad. 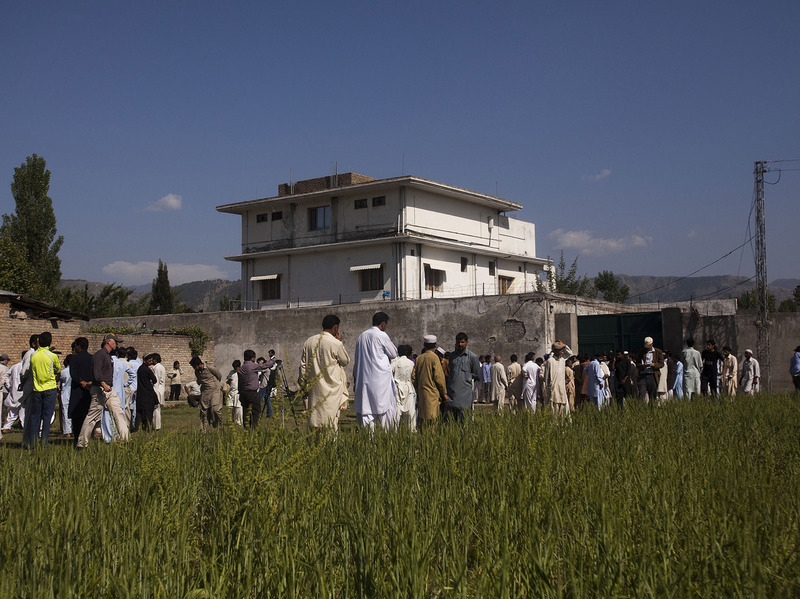 Pakistanis, along with international and local media, gather outside Osama bin Laden's compound, a day after the successful raid by U.S. Special Forces in May 2011. A federal appeals court ruled Tuesday in favor of the government's decision to keep photos and video of the May 2011 raid that killed Osama bin Laden a secret, rebuffing a conservative watchdog group that had sought their release. A three-judge panel of the U.S. Court of Appeals in Washington accepted a White House assertion that releasing the images, including death photos of bin Laden, could spark violence and risk the lives of Americans abroad. The government says the classified images show the dead al-Qaida leader at his compound in Abbottabad, Pakistan, the transportation of his body to a U.S. ship, and his burial at sea, according to Reuters. Court papers say the photographs were taken so the CIA could conduct facial recognition analysis to confirm the body's identity, the news agency reports. "It is undisputed that the government is withholding the images not to shield wrongdoing or embarrassment, but rather to prevent the killing of Americans and violence against American interests," read Tuesday's decision by U.S. Circuit Judges Merrick Garland, Judith Rogers and Harry Edwards. In its decision, the court rejected an argument by conservative group Judicial Watch "that the Central Intelligence Agency failed to show that releasing images of bin Laden's body — specifically those showing it cleaned and prepared for burial — would harm national security or reveal classified intelligence strategies," Bloomberg reports. Judicial Watch's Freedom of Information Act request elicited 52 records from the CIA, but the agency withheld all of them, citing exemptions for classified materials and information specifically exempted by other laws, according to The Associated Press. In a statement issued after Tuesday's decision, Judicial Watch called the judges' opinion "craven [and] absurd." "The courts need to stop rubberstamping this administration's improper secrecy," the organization said. "There is no provision of the Freedom of Information Act that allows documents to be kept secret because their release might offend our terrorist enemies. Our lawyers are considering our next legal steps." President Obama, speaking days after the May 2, 2011 raid, told CBS 60 Minutes that the release of "very graphic" photos of bin Laden's corpse could be used as propaganda by extremists to whip up anti-American violence. "We don't trot out this stuff as trophies," Obama said.